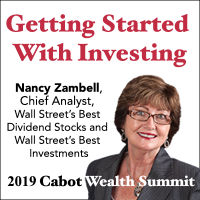 Nancy Zambell, Chief Analyst of Wall Street’s Best Dividend Stocks and Wall Street’s Best Investments will present a comprehensive overview of getting started with investing, Wednesday, August 14 from 3pm to 4:30pm, prior to the start of the 2019 Cabot Investors Summit. This session is perfect for people just getting started with Cabot, or those attending the summit as guests of investors. Experienced investors can benefit as well—there’s always something new to learn, even for experts. At this time, this offer is only available to registered Cabot Wealth Summit attendees. You can register for the Summit here. Once you register, you’ll be given the opportunity to add this seminar.